1. Punctuation in essays is used to indicate in writing the natural pauses, stress, and intonation of the spoken word. It is also used to clarify the meaning of a sentence. colon, and the full stop. These represent pauses of increasing length. 3. If you are in any doubt about punctuation, then use as little of it as possible. Write in short, direct sentences. It is perfectly possible to write clearly and efficiently using only the comma and the full stop. 4. Avoid using abbreviations (i.e., etc., &, e.g.) as well as too frequent use of the dash ( — ) and the exclamation mark (!). These all create the impression of a style which is too casual and chatty. 5. Abbreviations such as e.g.. and i.e.. are acceptable (and may be desirable) in your notes. However, if you wish to use any of these expressions in the body of your text, they should be written out fully in words – as for example and that is. 6. Short, clear, and simple sentences are usually more effective than those which are long and complex. If you are in any doubt at all, split up any longer sentences into two or three which are shorter. You are more likely to make your meaning clear with shorter rather than longer sentences. 8. The paragraph which follows demonstrates the correct use of the comma, semicolon, colon, and full stop. These are the most common marks of punctuation. 9. The use of brackets (technical name parentheses) should be kept to a minimum. They are used to indicate a supplementary remark, an authorial aside, or a qualification of some sort. However, if they are used too frequently they interrupt the flow of the argument and create a choppy, unsettling effect. 10. Square brackets [like these] are used to indicate authorial additions. They indicate your changes to somebody else’s text, or your comments on it. For instance, if you are quoting a text which requires brief explanation, you would insert your own remarks between square brackets. 11. If a quotation contains a mistake in the original you might wish to indicate that the error is not your own. This too is indicated by the use of square brackets. 12. Exclamation marks (!) should be used as little as possible in academic essays. They tend to create a slightly juvenile, overexcited tone. 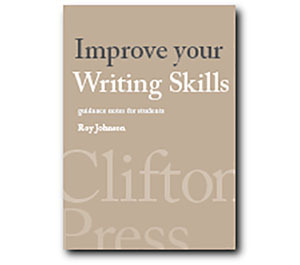 In any form of writing, the more frequently they are used the weaker becomes their effect. 13. The question mark (?) too should be used as little as possible. In fact questions should not normally be raised in essays – unless you are going to answer them. Keep in mind that most essays are posed in the form of questions which you should answer. 14. Try to minimise the use of the dash (—). These may be used singly to indicate an afterthought, or in pairs to insert an explanatory comment or a short list: ‘Everything — furniture, paintings, and books — survived the fire.’ They should not be used as a substitute for parentheses, or mixed with them. 15. The hyphen (-) is a short dash used to connect prefixes to words (multi-storey car park) or when forming compounds such as ‘son-in-law’ or a ‘couldn’t-care-less’ attitude. 16. In general, the oblique stroke (/) should not be used as a substitute for words such as ‘and’, ‘plus’, and ‘or’. Try to avoid the either/or construction and such lazy (and ugly) compounds as ‘an entire social/sexual/ideological system’. 17. Remember that the combination of colon-plus-dash (: — ) (which is called ‘the pointer’) is never necessary. Some people use this to indicate that a list will follow, but the colon alone should be sufficient. “These conventions are designed to give your essays a pleasing and well-designed appearance”, the tutor said to the students. 20. You do not need to put full stops after titles such as Mr, Dr, and Co (unless they occur at the end of a sentence). They are also not required in well-known business and company titles such as BBC and IBM. This is a practice which has now gone out of fashion. 21. Make a clear distinction between marks of punctuation such as the comma and the full stop, otherwise this may appear to produce weak grammar. ‘house style’. There are also minor differences in practice between the UK and the USA. The suggestions made above are based generally on common academic conventions in the UK.